Adviser: Ármann Höskuldsson, Research Scientist at the Earth Science Institute at the University of Iceland. Doctoral committee: Paul Martin Holm, Associate Professor at the University of Copenhagen. This is a joint degree with the University of Copenhagen. The defense has already been delivered. Opponents were: Þorvaldur Þórðarson, professor in Volcanology at the University of Iceland and Jennie Gilbert, Associate professor in Volcanology at the University of Lancaster. Iceland is one of the most active terrestrial volcanic regions on Earth with an average of more than 20 eruptions per century. Around 80% of all events are tephra generating explosive eruptions, but less than 10 % of all known tephra layers have been mapped. Recent hazard assessment models show that the two key parameters for hazard assessment modeling are total grain size distribution (TGSD) and eruptive style. These two parameters have been determined for even fewer eruptive events in Iceland. One of the most hazardous volcanoes in Iceland is Katla and no data set of TGSD or other eruptive parameters exist. Katla has not erupted for 99 years, but at least 2 of the 20 eruptions since the settlement of Iceland in 871 have reached Northern Europe as visible tephra fall. These eruptions occurred in 1755 and 1625 and remain enigmatic both in terms of actual size and eruption dynamics. This work presents studies of these two far-reaching eruptions in terms of fragmentation and eruption dynamics as well as the first set of eruption source parameters for any Katla eruption. In order to provide detailed insight into the eruption dynamics a new method for classifying fragmentation mechanisms based on tephra grain morphology was developed and is presented in this work. The deposits are estimated to cover 23400 km2 and 23600 km2 on land in Iceland for the 1755 and 1625 eruptions. Volumes calculated from the power-law integration method are 1.20-1.50 km3 for the 1755 eruption and 1.12-1.36 km3 for the 1625 eruptions. The total erupted mass converted from erupted volume of the 1755 eruption was 1.84-2.45⋅1012 kg with a lower-bound mass eruption rate of 1.25-1.67⋅106 kg/s. In 1625 Katla erupted between 1.53-1.94⋅1012 kg tephra as calculated from the erupted volume with a lower-bound mass eruption rate of 1.61-2.04⋅106 kg/s. The average 1755 plume height was 14.4 km based on mass loading data inversion with an empirical correlation estimate of paroxysmal peaks at 25± 6 km. The average 1625 plume height was 16.6 km based on mass loading data inversion with an empirical correlation estimate of paroxysmal peaks at 25± 6 km. A new quantitative method producing grain shape data of bulk samples of volcanic ash was developed to correlate the bulk average grain shape with magma fragmentation mechanisms. The new shape index: the regularity index (RI) was developed from a manually classified reference morphology dataset using principal component analysis. The systematic change in RI between wet and dry eruptions supports that the RI can be used to assess the relative roles of magmatic versus phreatomagmatic fragmentation. Surtseyan ash has an RI of 0.207-0.191 ± 0.002 (2σ), whereas Hawaiian ash has an RI of 0.134 ± 0.001 (2σ) and these samples represent the extremes of the fragmentation spectrum. Subglacial samples show intermediate RIs of 0.168 ± 0.002 (2σ), 0.175 ± 0.002 (2σ) and lacustrine samples have slightly higher RI of 0.187 ± 0.002 (2σ). The method uses automated image analysis of 2D projections ash grains in the size range 125-63 mm. Loose bulk samples from the deposits of 6 different basaltic eruptions were analyzed and 20,000 shape measurements of 26 shape parameters for each were obtained within ~45 min using the Particle InsightTM dynamic shape analyzer (PIdsa). The RI modeling showed that subglacial eruptions were controlled by both magmatic and phreatomagmatic fragmentation processes. Further investigations determined the RI of consecutive depositional units of both the 1755 and 1625 eruptions. The detailed models showed that the fragmentation processes in the 1755 eruption was a stable combination of magmatic degassing and magma/water-interaction with only minor perturbations, whereas the 1625 eruption went progressively from predominantly phreatomagmatic to predominantly magmatic and back to phreatomagmatic. This study documents that the amount of and access to melt water can change significantly during subglacial eruptions and that magmatic processes play an important role in the fragmentation process. The RI study was combined with field data on deposit stratigraphy, granulometric modeling, componentry, and written accounts of the eruptions and produced a coherent model of the evolution of the eruptions. The collective data set shows that the 1755 eruption was a continuous uprush eruption much like the recent 2011 Grímsvötn eruption. However, the 1755 Katla eruption had a longer duration of 17 days and a higher mass eruption rate. The 1625 eruption was a dynamic eruption less influenced by magma/melt-water interaction, which agrees well with the higher average plume height as compared to the 1755 eruption. This work has contributed to the general understanding of the fragmentation dynamics of large subglacial eruptions. It has also provided much needed data for improvement of future hazard and risk assessments of one of the most hazardous volcanoes in Iceland. Furthermore the RI method is expected to be widely applicable to tephra morphology studies and to be helpful during the next volcanic ash crises. 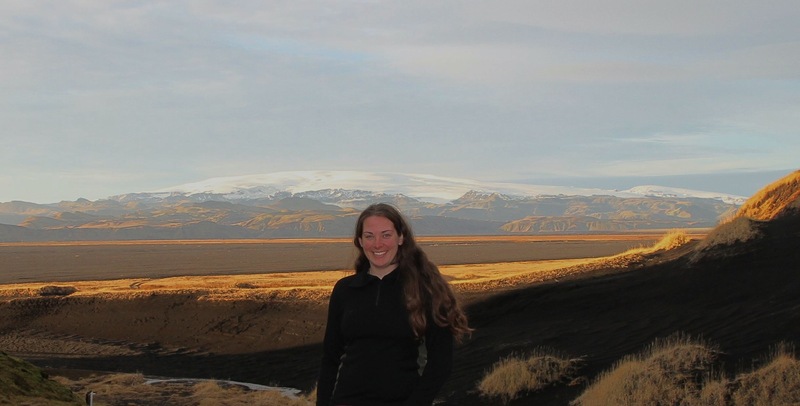 Johanne Schmith obtained a Master’s degree in Geoscience from University of Copenhagen, Denmark studying the mantle-melting source of the Cape Verde hotspot. She has a B.Sc. in geology-geophysics and spent 6 month in Hawaii studying volcanology and volcano monitoring at UH Hilo.